It’s nearly three decades since I studied medieval literature at university. This afternoon I searched out my copies of The Vision of Piers Plowman, Le Morte Arthur and Sir Gawain and the Green Knight to give to my son who’s about to go to university to study English literature himself. It’s a sobering reminder of time’s passage. Or, to put it more brutally, a sure way for a mother to feel 103. A good tree produces good fruit? 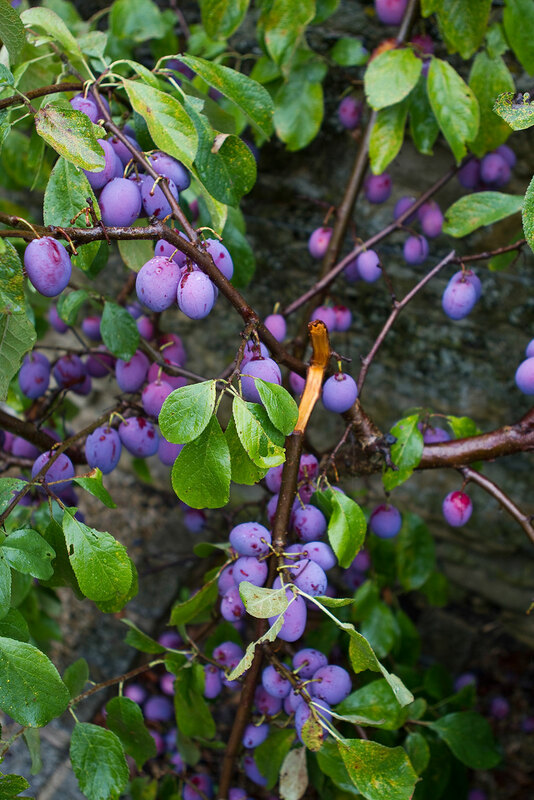 Much as I love Piers Plowman, I have to argue, if only in defence of the abominable-looking plum tree in my garden. It’s misshapen, wonky, stunted, ugly and has snapped branches – and yet it’s the producer of the most delicious fruit you could ask for. Even our dog takes a detour round the tree at this time of year to grab a quick snack. Its neighbour, the greengage tree, is twice as tall and is serenely elegant …and the fruit is a disaster. If Langland had ever dropped by and tasted both plums and greengages, Passus II, line 27 of his poem could have been totally different: ‘A bad tree can produce real belters. A good tree can lie through its teeth’. Langland’s poem argues trenchantly in favour of simplicity and against desire. Which puts me in a tricky position yet again. What would he have made of today’s lunch of tartiflette? It was oh-so simple and yet oh-so desirable. There’s probably some Aristotelean ethical defence for those who indulge in both simplicity and luxury at the same time, but I don’t know what it is. 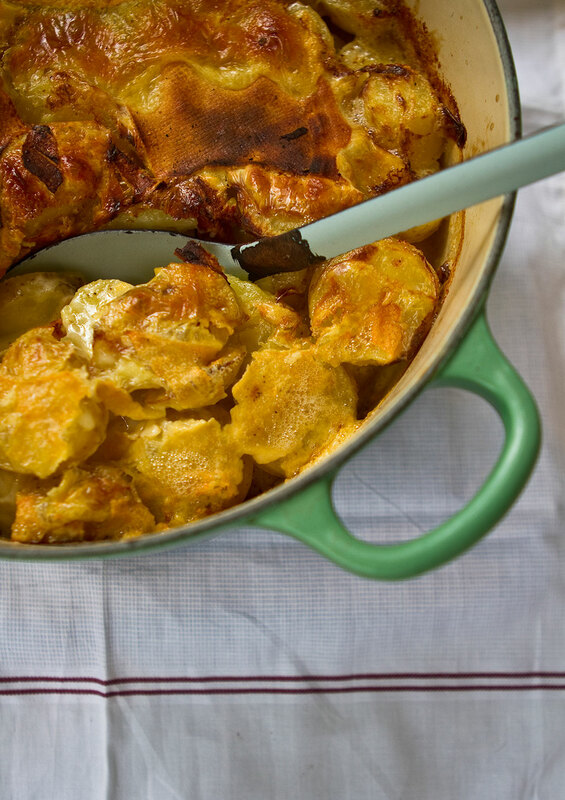 Tartiflette is a word that could have come straight from a medieval dictionary, although, sadly, it doesn’t. It’s a variation on a French regional word for potatoes and the dish is an extravagant advertisement for reblochon cheese. I’ll give you the classic version here, but it’s just as nice made with other cheeses. Last week I made it with a combination of brie, pecorino and Cheddar and if that’s not an edible argument for the European Union, I don’t know what is. Cook the potatoes in salted water until just, only just, cooked. Drain and leave to cool. Snip the bacon into 2 centimetre pieces and fry – there’s no need to add any extra oil – until crisp. (Many recipes suggest that you use lardons, but their plump, squat chewiness seems all wrong to me.) Add the onion slices, thyme leaves and bay leaves and continue to cook until the onions are soft, but not too coloured. Add the white wine and reduce until only a little remains. Take off the heat. Slice the potatoes into rounds about half a centimetre thick and divide roughly into three piles. Line the casserole dish with one layer of potato, then spoon over half the bacon and onion mixture. Barely trickle some cream over this – only enough for a miser to think it generous. Grind black pepper over and then repeat the potato/bacon/cream routine. (I don’t add salt because it’s so easy to overdo it, but simply add it at the table if necessary.) Finally, put the last layer of potatoes on top and add the last trickle of cream. Pour the stock over the whole lot and add another grind of black pepper. Take your half-moon shaped slab of reblochon and, instead of cutting downwards, slice it horizontally, so that your knife is parallel with the work surface. Then, open up the cheese to form a perfect circle. Lay this circle on top of the potatoes, so that the rind is uppermost, and cook in the oven for twenty minutes. Finally, place under the grill for another five. It’s often suggested that a green salad goes well with it, which it does, but I like it just as much with spinach and a little grated lemon zest. Bould was hir face, and fair, and reed of hewe. Bold, hearty, handsome and rosy cheeked – the Wife of Bath and tartiflette could have been made for each other. Delicious food, delicious photographs and the bonus of some classy Eng Lit: what more could one ask? There can’t be many blogs out there which nurture the palate, the eye and the brain in so satisfying a manner. There can’t be many comments out there that nurture the spirit in so satisfying a manner either – thanks so much. Very well spotted! I decided it was a variation on the tree theme – trees and fruit etc. – so left it out. 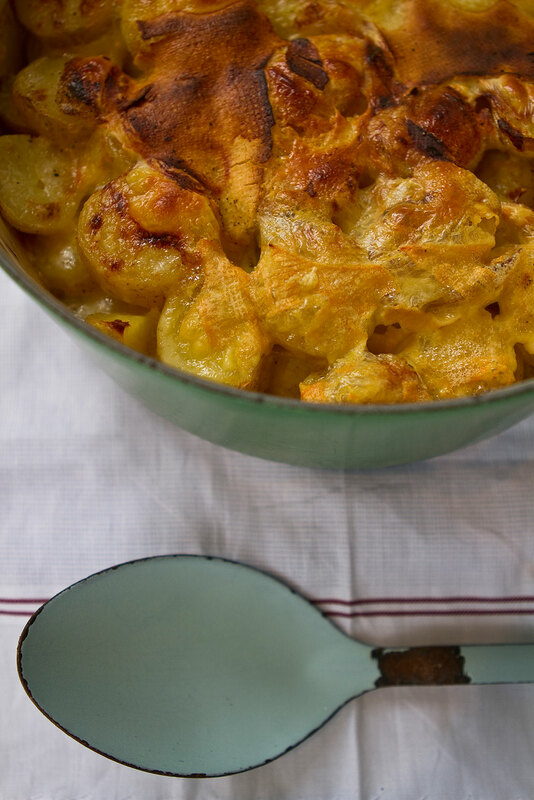 I hope you enjoy the tartiflette if you make it. As winter looms ever closer it seems like an important task to bolster ones arsenal of recipes with a feel good favourite, and this seems to hit the nail on the proverbial head so to speak. Another great post Charlie! Thanks very much, Boinsey – and you’re quite right that it’s the perfect food for winter. It’s a pot version of raclette in lots of ways and just as filling. Lovely to read your thoughts Charlie! Tartiflette is delicious throughout the year. Always have a good reblochon in the freezer for spontaneous comfort. Ahh fickle fruit trees so ready to dupe one. Bon appetit! Reblochon in the freezer? 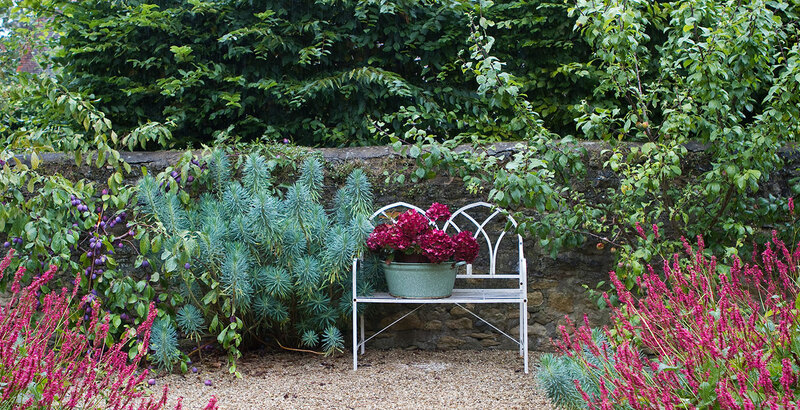 What panache – and so much more glamorous than frozen peas! I’m planning to make Diana Henry’s plum and liquorice chutney with them. It’s not something I’ve tried before, but I loved liquorice allsorts as a child, so I think it’s worth trying. You’re so right about French food – the simple and the luxurious. I will up my productivity levels, I promise! Thanks so much for your enthusiasm, Michael – and for your lovely comment. I do like your version of a European Union… of cheese … and the vision of your dog snaffling plums. The dog’s love for plums isn’t a sign that they’re any good; she’s a spaniel, so she’ll eat anything – even the greengages. That sounds so good. I realise now that I’ve been making unauthentic tartiflettes without any wine – the real thing next time! Might even be this weekend now you’ve reminded me how good they are. I’m not sure if mine’s authentic either, but I think it tastes better with the wine added. Tartiflette in hospital? Now that really would be an aid to recovery. I always find that the trick with Old and Middle English is to read it aloud with real gusto and oomph – the meaning seeps out in the end, like molten cheese.